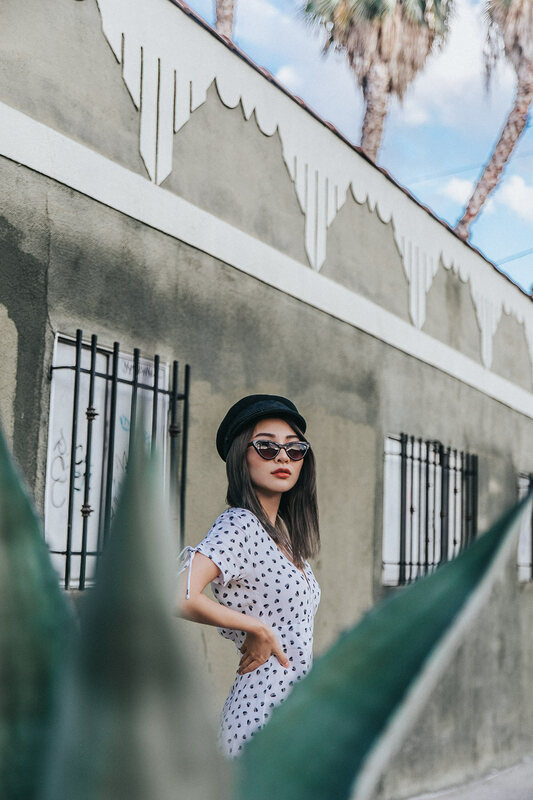 I found this beautiful olive green building with Art Deco features in Echo Park and just had to shoot this outfit with the olive toned background. I love light fabric flowy dresses. They feel so LA. It’s comfy, casual, chic and sunny. All major characteristics I’d use to describe the fashion and vibe of Los Angeles. I paired the dress with a rustic buckle suede boots to give it a bit more of a country flare. Yesss to this dress, it’ll be perfect for out hot summer now down under. I love these booties! They look really classy and easy to pair with so many different outfits. LA is really changing lately – pretty cool that you found a neat spot for the photoshoots. I haven’t really explored Echo Park even though I’ve lived in LA for my life. Keep it up! Cute look you have here dear! Love the dress on you, classic style. I totally love your outfit! Casual, yet chic. Not to mention that you look completely amazing. I adore this dress girl! I love finding hidden gems like this <3 🙂 The olive green matches your dress sooo perfectly!